Mumbai: Boosted by a weak rupee, technology stocks outpaced benchmark indices in 2018. In the year gone by, the BSE IT index gained 25%, outpacing the benchmark Sensex’s 5.9% gain. As Indian IT (information technology) companies earn mostly in dollars, a weak rupee meant higher revenue. The rupee weakened 8.46% against the dollar in 2018, touching a record low of 74.48 to the dollar in October. This makes 2018 the best year for the BSE IT index since 2013. 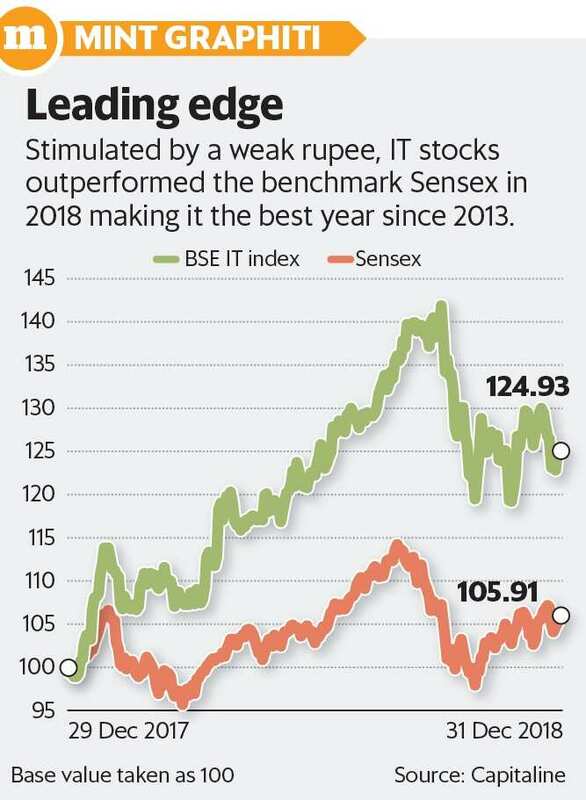 In 2017, by contrast, even as the Sensex rose 28%, the BSE IT index gained only 11%, as revenue grew at a slower pace in large IT services companies. In 2016, it had slipped 8%. It gained 4.26% in 2015, advanced 17.6% in 2014 and jumped 55% in the previous year. Among IT stocks, Tata Consultancy Services Ltd, Infosys Ltd, HCL Technologies Ltd, Tech Mahindra Ltd and Wipro Ltd were up 5-43% in 2018. In September, a Kotak Institutional Equities note had said a 1% rupee depreciation aids earnings before interest and taxes (Ebit) margin of IT firms by 20-30 basis points (bps) and net operating profit after tax by 2-3%. One basis point is one-hundredth of a percentage point. However, analysts believe the rate of growth for IT companies is unlikely to quicken in 2019 due to slow economic growth across the US and Europe, Brexit-related uncertainty in the UK, soft PMI/confidence indicators in Germany and the UK, and weak client financials. “Slower-growing legacy could be a drag, and digital, while strong, could moderate in percentage terms as the base effects kick in. We build earnings per share (EPS) CAGR (compound annual growth rate) of 10.5% over FY18-21 for tier-I IT, which could have risks if the current dollar-rupee rate of 70 is sustained. Valuations of 17.6 times one-year forward EPS (in line with history) have not adjusted for slowing growth, margin pressures or external risks," said Nomura in a note on 3 January. Besides technology stocks, BSE FMCG (up 10.6%), BSE Bankex (up 5.27%) were gainers among sectoral indices in 2017. Meanwhile, BSE Realty and BSE Telecom were the worst performers of 2018. While BSE Realty lost 31% after more than doubling in 2017, BSE Telecom slipped 41% following a rise of 49% in the previous year. Among BSE 500 stocks, Merck Ltd, NIIT Technologies Ltd, V-Mart Retail Ltd and L&T Technology Services Ltd were top gainers while PC Jeweller Ltd, Manpasand Beverages Ltd, Shankara Building Products Ltd, Jaiprakash Associates Ltd and Navkar Corporation Ltd were major losers in 2018. The benchmark Sensex and Nifty gained 5.91% and 3.15%, respectively, in 2018 after a blockbuster year for equities in 2017. However, both BSE mid-cap and BSE small-cap indices slipped to seven-year lows on concerns of steep valuations and regulatory measures. Among major markets, the Shanghai Stock Exchange Composite Index (down 25%) saw the steepest decline in 2018. The MSCI Emerging Markets and MSCI World indices slipped 17% and 11%, respectively, in the year gone by. Amid stock market volatility, foreign institutional investors fled India and equity markets saw a net outflow of $4.38 billion, the steepest sell-off in a decade. However, domestic institutional investors invested a record ₹ 1.09 trillion in Indian equities. Crude prices rose 12.86% from January till October but fell 18.47% in the year.